Filled with inspiring stories and photographs, this heartfelt tribute to the pit bull celebrates one of America’s most popular yet misunderstood dogs. 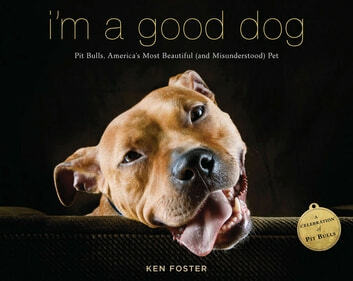 Founder of the Sula Foundation, which promotes responsible pit bull ownership in New Orleans, and the author of two acclaimed books about abandoned dogs, Foster has made it his mission to bring overlooked canines into the limelight. I’m a Good Dog traces the fascinating history of this particularly maligned breed. A century ago, the pit bull was considered a family dog, featured in family photos and trusted as loving companions for children. More recently, pit bulls have been portrayed by the media as stereotypes of everything they are not. Foster shatters that reputation through moving profiles of pit bulls that serve as therapy dogs, athletic heroes, search-and-rescue dogs, and educators, not to mention as loving pets. Foster also profiles many pit bull lovers, from Helen Keller and Dr. Seuss to actor Todd Cerveris, who took his pit bull on tour with him for the musical Spring Awakening. Proving that there’s much to love and nothing to fear, I’m a Good Dog restores the pit bull to its rightful place as friend, family member, athlete and entertainer. I Golf Therefore I Am--Nuts!